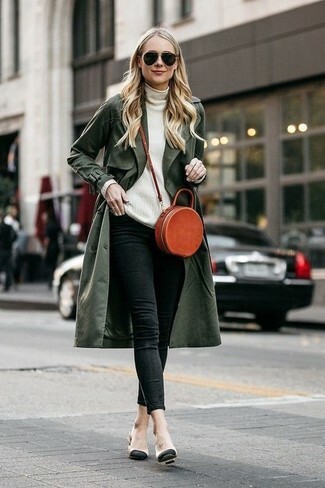 If you're on the hunt for a casual yet chic ensemble, wear an olive trenchcoat with a white midi dress. Both pieces are totally comfy and will look fabulous paired together. Finish off with white leather ankle boots and off you go looking wonderful. 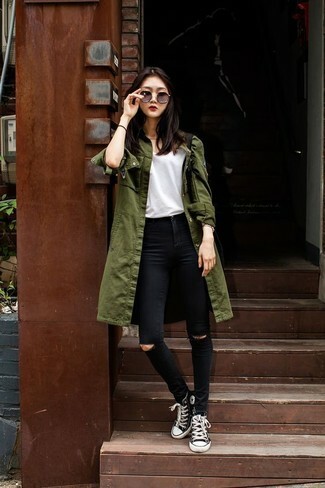 If you're on a mission for a casual yet chic getup, try teaming an ATTICO maxi trench coat with black ripped skinny jeans. Both garments are totally comfy and will look fabulous paired together. Make your look more fun by finishing off with black and white high top sneakers. 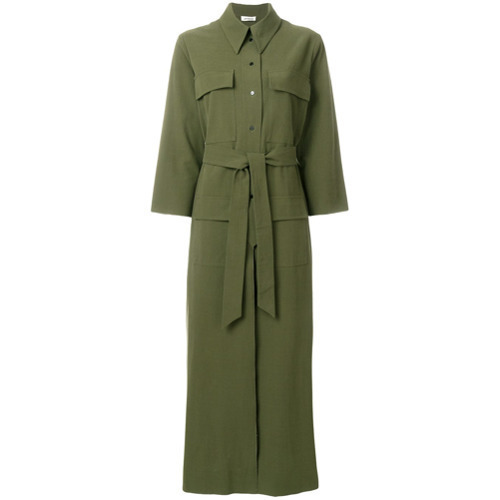 An ATTICO maxi trench coat and a dark green plaid shirtdress is a nice combination worth integrating into your wardrobe. When it comes to footwear, this getup pairs wonderfully with black leather over the knee boots. If you like a more casual approach to fashion, why not consider teaming an ATTICO maxi trench coat with charcoal jeans? Rock a pair of black leather flat sandals to make the outfit current. Effortlessly blurring the line between chic and casual, this combo of an ATTICO maxi trench coat and black skinny jeans is likely to become one of your favorites. Beige leather pumps complement this outfit quite well. An ATTICO maxi trench coat and black skinny jeans are absolute staples if you're figuring out a casual wardrobe that matches up to the highest fashion standards. Choose a pair of black and white canvas high top sneakers to make the outfit more current. If you're scouting for a casual yet stylish getup, reach for an ATTICO maxi trench coat and a black jumpsuit. Both of these pieces are totally comfy and they also look great paired together. Kick up the cool of your getup by complementing it with black suede pumps. For a casually elegant look, reach for an ATTICO maxi trench coat from farfetch.com and black skinny pants — these two items play nicely together. For shoes, choose a pair of black leather heeled sandals. 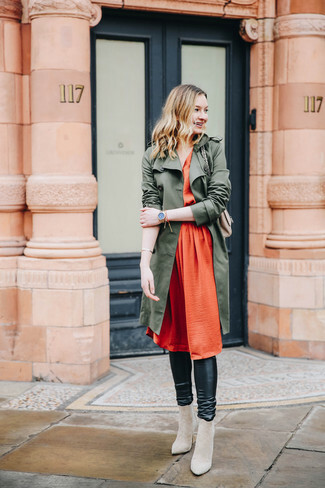 If you're scouting for a casual yet absolutely stylish ensemble, try pairing an ATTICO maxi trench coat from farfetch.com with black leather leggings. These two garments are totally comfortable and they will also look stunning paired together. You could perhaps get a little creative in the footwear department and elevate your ensemble with beige suede ankle boots.